Look out for Horsfield to appear on a very special Children in Need episode of DIY SOS, airing on Thursday 18th November 2016. 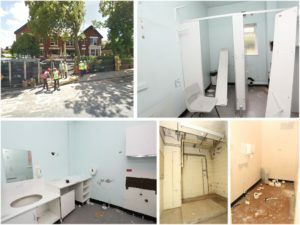 The DIY SOS team joined forces with hundreds of local tradespeople to renovate Blackpool Carer’s Centre. Read their report here to get their view on the monuments event. When we were contacted, the SC Horsfield team knew this wasn’t something we could turn down. The Carer’s Centre is such a valuable community resource that we leaped at the chance to help out. As the Centre is a charity and operates on limited funding, we knew that the end result would need to be highly cost effective and efficient, as less money spent on paying the bills means more to go where it is most needed. We knew that ATAG’s Q60 boilers would be the best for the job. They are highly efficient, extremely resilient, and very simple to operate and maintain. Perfect for the Blackpool Carer’s Centre’s needs. On top of needing the very best of easy to use, cheap and reliable to maintain, and long lasting, Blackpool Carer’s Centre needed to account for specialist equipment and access requirements vital to many of their key users. There were also very narrow time periods available where the work could be done and the cameramen and women could get what they needed to make the special Children In Need episode of the show. The build needed to be planned meticulously, with no detail left unaddressed and every hour scheduled. 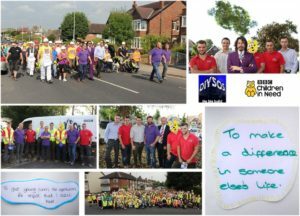 Working in harmony with hundreds of other people was absolutely vital – but as many will tell you, working on DIY SOS is like working as part of a huge extended family and everyone collaborated excellently. Our Site Supervisor Eddie was involved in initial scheduling and ensuring the project’s speedy progression. 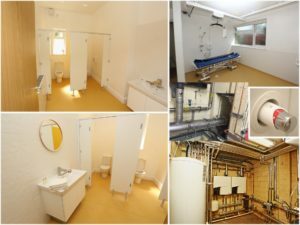 The Horsfield team was also involved in much of the initial plumbing and electicical work; installing the mains, heating pipes, radiator plumbing, and domestic services to bathroom & toilet facilities. Throughout the build, we also supervised and co-ordinated a number of the other plumbers. In wrapping up, we also collaborated on the radiators, showers, toilets, and sinks; and the commisioning and final fix of the boiler house. Let us know what you think of the episode, and take a look at the before and after shots below.